Ward 8 schools are set to lose a total of $10.4 million. It means fairness, no matter what school you attend. But some education leaders are upset with the proposed budget for DC Public Schools, and argue there is no equity in the way money is allocated. "If we keep dis-investing in schools like these we put these schools in downward spiral,” said DC School Board member Markus Batchelor. The star rating report launched in December was designed to let leaders know which school need the most resources. A spokesperson for DCPS said schools that received a one-star rating received $75,000. However, according to the proposed budget, those schools are also receiving the largest budget cuts for FY2020. See how Mayor Muriel Bowser's proposed budget for Fiscal Year 2020 will affect school funding, aggregated by ward. 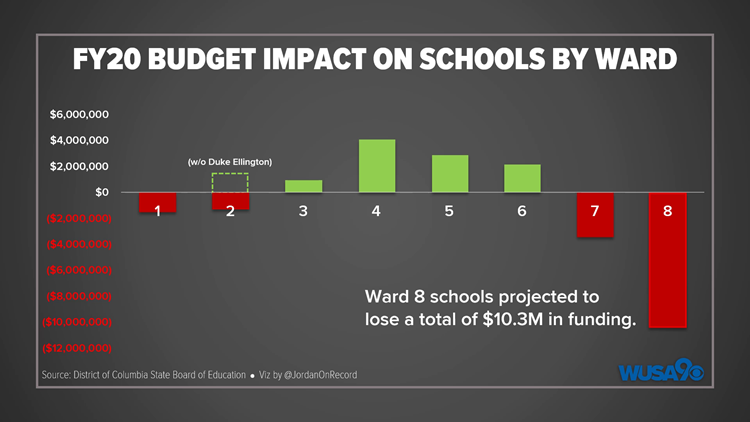 Ward 8 schools are taking the biggest hit with a projected loss of $10.3 million dollars. That mean less programs, teachers and social workers at 15 out of the 20 schools in Ward 8. Anacostia High could lose $1.2 million, the equivalent of 12 teachers. Enrollment there is way down at just 266 students; 95 percent of whom are deemed at risk. The Washington Teachers Union rallied on the steps of the Wilson building Friday where City Council members were reviewing the budget. They are calling on the government to “fund our future” and kicked off a campaign and petition drive. “I've heard time and again from many city leaders that our budget reflects our priorities if these students aren't our priorities, who are?” asked Batchelor. WUSA9 reached out to DCPS and a spokesperson said the cuts to schools in Ward 8 reflect low enrollment and the schools that no longer have the extended school year program. In February, DCPS announced it was using that $4.6 million to invest in technology. But a closer look at the budget shows only one school in Ward 3, one of the city’s most affluent ward, is receiving a budget cut. Six out of the 10 D.C. Public Schools set to lose money are all located in Ward 8, the city’s poorest area. Use the tool below to see how your school, ZIP code or ward is impacted.